Located near the intersection of E Southern Ave and S Higley Rd, Extra Space Storage serves residents of Mesa. Locals will recognize our facility a few minutes west of Leisure World and Walmart near Central Valley Dental Care. We're also accessible for residents of nearby apartments, such as Stone Canyon Apartments, Villas on Hampton Avenue, The Traditions Apartments, and Envision Apartments. I was looking for a storage space near our home and found Extra Space Storage. As soon as I walked in I felt very welcomed and like I had been a customer for years. The store manager helped me out and she was extremely thorough on the process from beginning to end. It was my first time renting a storage so I wasn't sure how the process worked. I also appreciate the amazing security from the keypad to the actual manager living on site. I know that my belongings are well taken care of. 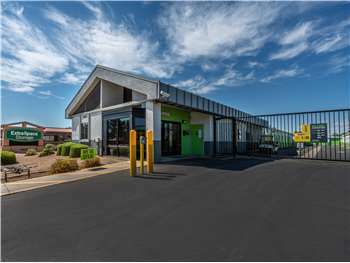 For the price and location Self Storage is perfect! Janet, in the office, is very helpful and friendly. It's much cleaner and what appears to be safer than other storage areas. This is the first time I've used a self-storage unit. Janet has made it very easy to understand how everything works. I would not hesitate to refer others to Extra Space Storage!! The staff is very friendly. They are dedicated in serving and meeting their customers needs. The rates are reasonable and we were offered a special deal which was half off first month's rent. The facility is safe and clean. The location manager is great at 5510 E Southern in Mesa and the facility is nice but my issue is with the price increases almost every month. I have had two units with Extra Space and they have increased my rate several times. They say the rate increase is because of supply and demand but when demand is low, my rate doesn't go back down. I guess when they get you into a unit, they assume you won't leave and they can charge you more. Very poor experience. Drive south on S Higley Rd. Turn left onto E Southern Ave. Our facility will be on your left after S 54th St.
Drive north on N Higley Rd. Turn right onto E Southern Ave. Our facility will be on your left after S 54th St.
Drive west on E Southern Ave. Pass Walmart and continue west. Our facility will be on your right after S Somerset. Drive east on E Southern Ave. Pass Franklin at Brimhall and continue east. Our facility will be on your left after S 54th St.